Video: Sotheby's and Anna Clark present The English Style 1700-1880 (approx 50 mins). 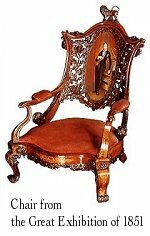 Includes both revision over styles covered in last week's lecture and also some excellent examples of Victorian interiors, furniture, furnishings and tableware. 19th-c Britain: major colonial power with extensive international markets. With the Industrial Revolution had come mass production - with the development of more efficient transport had created mass markets. Machines replaced traditional hand skills. New social structures were developing - a Middle Class. 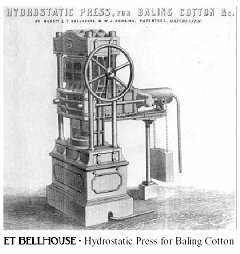 There was rapid change and technological innovation. "Rule Britannia", "Land of Hope & Glory" (or any other Elgar), "God Save the Queen". Perhaps the defining event of the High Victorian Era was the Great Exhibition of 1851, London, was the showcase for Britain's industrial achievements. 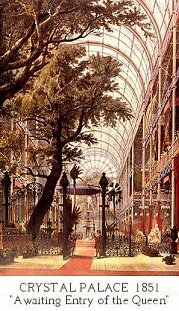 The exhibition hall of glass and steel (the 'Crystal Palace') was designed by Joseph Paxton. Regarded as a great success by some, others thought the products on display were excessively complex and ornamental, cold and industrial, and out of touch with people's needs. The exhibition was the catalyst for design reform, giving rise to the Arts and Crafts Movement led by William Morris. We will be covering later Victorian styles such as Japonisme and the Arts and Crafts Movement in more detail over the next two weeks. 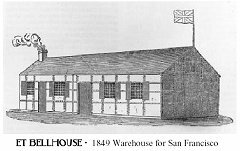 Designed prefabricated iron buildings, including inexpensive ready-made buildings that emigrants to the new colonies could take with them for erection on arrival. 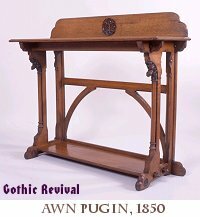 AWN Pugin was the leading architect of the Victorian Gothic Revival. As a passionate convert to Roman Catholicism in his early 20's, he wanted to inspire religious awe by reproducing genuine medieval craftsmanship in grand cathedrals. 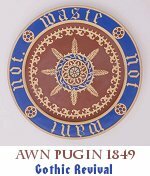 Apart from his buildings, Pugin also made furniture and tableware in a medieval style. He published influential works such as "The True Principles of Christian Architecture". Definition of Gothic Revival: A style influenced by medieval and Gothic influences popular in the mid-1800s, characterized by lines flowing up to a pointed arch and other Gothic architectural features. This stream of Victoriana evolved into the Arts & Crafts Movement and Aestheticism, which we'll be covering over the next weeks. 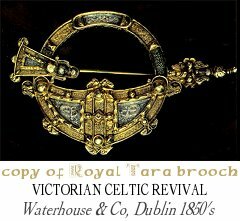 The nostalgia for glorious times past also showed in jewellery in the Celtic Revival style. Celtic crosses also became popular in this period. These had not been used since Medieval times. 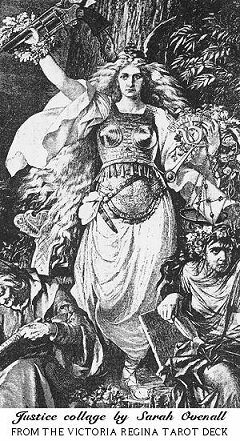 The Celtic Revival was particularly popular in Ireland and Scotland for political reasons (note: the Welsh, Scots and Irish are generally of Celtic origin, whereas the English are not). It was especially significant in literature. These were not just decorative items, but emblems of patriotism and a national identity - the context in this case was very important. As well as collecting the exotic from their colonial expansion, the Victorians also loved to document it. 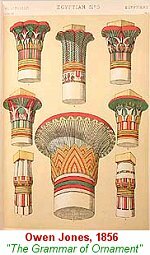 Owen Jones was a Welsh architect who travelled all over the world on a Grand Tour, collecting and copying architectural ornamentation. His lush, beautifully illustrated and yet very scientific volumes are still being published today as sourcebooks for architects, interior designers and artists. Increased literacy meant more people could read... advertisements! Chemistry developed new dyes, for example developing an artificial and inexpensive mauve for the first time. The first Plastics are developed, eg Celluloid (1866) - developed as a substitute for ivory to make billiard balls with! Post Impressionism (1890's): Van Gogh, Gaugin. References: Partly based on lecture notes prepared by P. Garn-Jones. Additional material by Kat Black.